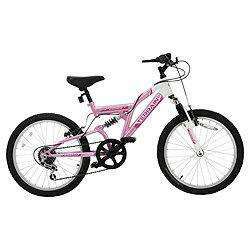 Get active in the great outdoors with the Terrain Vesuvius 20" girls' mountain bike. With a sturdy steel frame and 6 speed shift gears, this striking pink bike provides a great amount of control while you ride across the countryside. The dual suspension allows you to take on more challenging environments, ensuring you enjoy a comfortable ride when cycling over uneven ground. Complete with front and rear V-brakes the Terrain Vesuvius provides the stopping power you need when exploring the great outdoors. Age range 7-9 years. 19-27" inside leg. These were on offer in South Road Dundee store for £45. Sign said £45, scanned through at £55. Possibly get it for £35 if they honour the double the difference cash back. Thanks, just ordered. Got for £45 using £10 off code and store collection. ......bargain ! !